Dutch Universities have announced a plan to boycott the Dutch publisher Elsevier. The firm now publishes a wide range of scientific books and journals, in which some of my own articles have even appeared. But how many people know of the role that they played in bringing Galileo’s scientific discoveries to public attention? Most people know the story of how, after Galileo published his Dialogue Concerning the Two Chief World Systems, he was threatened with torture and forced to “abjure, curse and detest” his heretical view that the Earth goes round the Sun. His book was placed on the infamous Index librorum prohibitorum – the index of banned books – and he was placed under house arrest for the rest of his life. What most people don’t know is that Galileo’s house arrest was not entirely onerous. He spent the first part of it as an honoured guest in the home of the Tuscan ambassador before moving to the residence of the archbishop of Siena, where he was given facilities to start writing his book, which he called Dialogues Concerning Two New Sciences, a book that he continued to write after finally being allowed to return to his own villa in Arcetri. 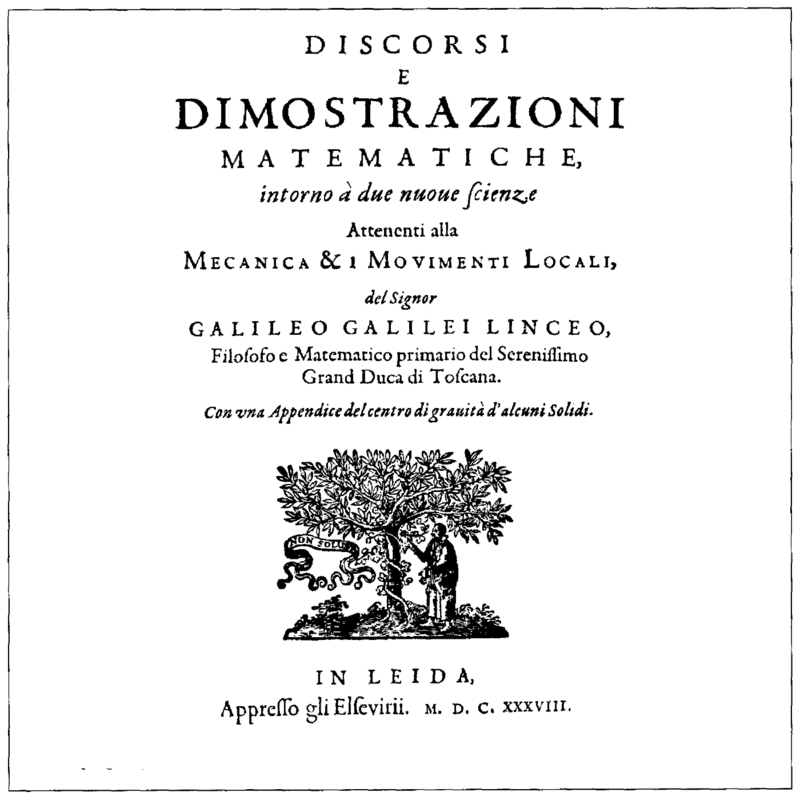 Even fewer people know that Dialogues Concerning Two New Sciences was smuggled out of Italy and printed by the Dutch publisher Louis Elsevier. Elsevier was taking quite a risk, since he had sought advice from the Inquisition and had specifically been told that all of Galileo’s writings were banned from publication, both in Italy and elsewhere. He was rewarded, however, by a best-seller that created a sensation in the European scientific community through its revelations of hitherto unknown laws and their practical applications. It contains the first description of the scaling laws that describe the strength of material structures, and which form the basis of modern architectural and engineering practice. Galileo also demonstrated in Dialogues Concerning Two New Sciences that objects moving at a constant velocity will keep on doing so even if nothing is pushing or pulling them, thus demolishing the old Aristotelian ideas at a stroke, and providing a basis for Newton’s First Law of Motion. So the original Elsevier made a major contribution to science and civilization. It will be interesting to see what happens now to the firm that has inherited his mantle.